Compared to other parts of the country, school here in the northeast US starts “late” – we don’t go back until after Labor Day in September, while most of the country goes back mid to late August. I like it this way because it really seems more like fall when school starts again. What I also like, is that the start of school brings party planning for my oldest son’s birthday, followed closely by Halloween, Thanksgiving, and of course Christmas. With so many occasions to celebrate in the coming months, the opportunity to review stationery from Bunny Prints came at the perfect time! I received a $50 site credit to Bunny Prints for this review. My first stop on the site was the boys birthday party favor section. With my oldest son’s birthday right around the corner I wanted to see if there was anything cute and fun to add to the party bags. 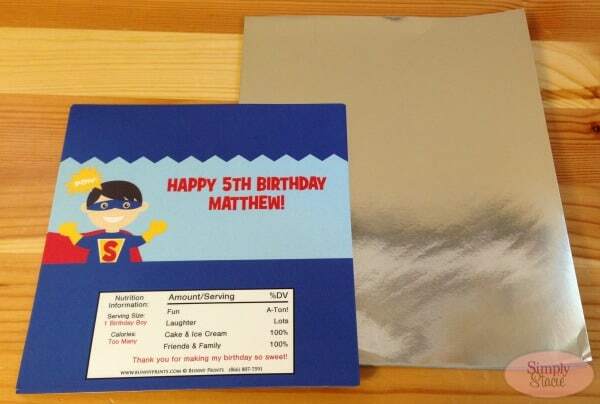 What I found was a great superhero design candy wrapper – perfect for my superhero-obsessed son! All I had to do to personalize the details of my wrapper was click on the “personalize this item” icon. When I did I was given the options to personalize the text type, colors, sizes, etc. After I was done personalizing I was given a preview of my item before adding it to my cart. They arrived looking just as they did on the screen and I’m excited to add these to my party favor mix. These wrappers sell for only 90 cents a piece. After finishing up with my son’s birthday treats, I decided to check out the holiday section of the site. I love everything Christmas, so I just had to order a few things from this section! The first item I fell in love with was the Whimsical Christmas Tree Sticker. I use these as envelope sealers for my Christmas cards as well as decorations on plain wrapping paper. At only $6 for 30 stickers, this is a great deal. You can personalize this sticker any way you want, but I decided to stick with the traditional Merry Christmas. I decided to get the matching Lime Christmas Tree return address labels, also $6 for 30 labels. 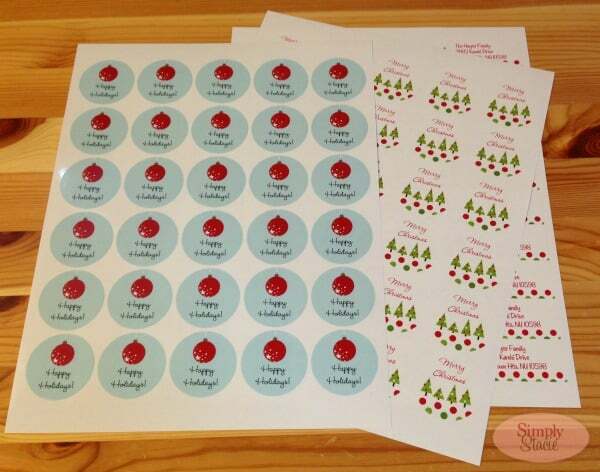 I also picked up a set of Ornament Christmas Holiday stickers so that I could mix and match with the trees. With some money left to spend, I headed for the DIY favors sections of the site. 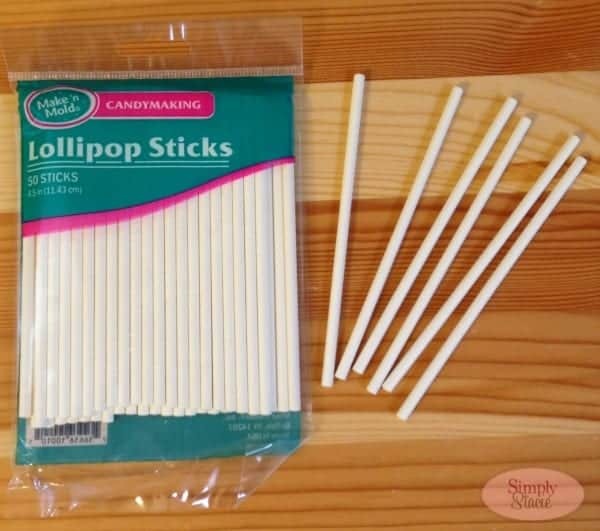 There I picked up a pack of white lollipop sticks. A bag of 50 for only $2.50. I like to have these on hand for parties and for when my boys and I get creative and decided to make chocolate pops for ourselves on a whim! Bunny Prints is definitely a site I’ll be returning to. I’ve already bookmarked it for future reference. The site is easy to navigate, personalizing is a breeze, and they have a great selection of items – from invites, to party favors – for all occasions. With a mission to give customers modern and unique designs, Bunny Prints guarantees you’ll love what you purchase or they’ll give you a full refund within 30 days of receipt! To see all the fun stuff Bunny Prints has to offer, visit their site. OPI’s New Pink of Hearts Duo and Designer Series Shades! I love the Christmas candy bar wrappers! I like the Christmas Personalized Candy Wrappers. I like the onstruction Notebook Favors. I love the Construction Notebook Favors!!!! I liked the Boys 1st Birthday Note Cards.